Can a $35 PC really run a full blown HD Media Center? Where can I get a $35 PC? From Raspberry PI. The goal of Raspberrypi.org is a noble one: make computing affordable for every student. As long as the student has access to a monitor or TV, a keyboard, mouse and some inexpensive storage, they are able to have a computer capable of running (primarily) Linux and a software development environment. Essentially, it’s fully-fledged computer on a very small PCB (slightly bigger than a credit card). The PCB measures 85.60mm x 53.98mm x 17mm, with a little overlap for connectors. Fractionally too big for an Altoids tin (all it needed was rounded corners): a big marketing error! Is it suitable for streaming? The model B ($35 version) has 256MB of RAM, which is not, unfortunately, expandable. That doesn’t mean it can’t stream, as it’s possible to run Linux in a few 10’s of megabytes (something you wouldn’t dream of trying with Windows or OS X). Obviously, an OS is required and Linux is the obvious choice. Initially Fedora, Debian and ArchLinux are supported. OpenELEC is also available. 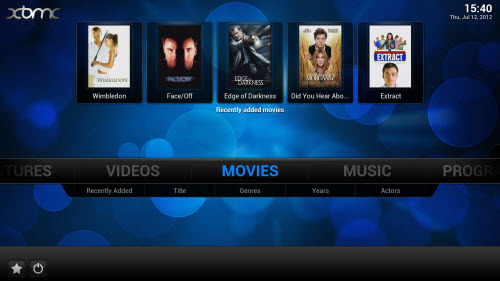 XBMC seems to be the media center software of choice. No knowledge of Linux is needed. If you want to use the Raspberry Pi as an XBMC frontend you can do exactly that with no knowledge of how anything works. It can be installed with a few simple clicks from a Mac or a PC running Windows or Linux. It’s auto updating, meaning you constantly get new features, performance and driver updates. You can however turn updates off at any time. Share your content from your PC over NFS, SMB, FTP and HTTP. AirPlay and AirTunes support allow you to send music and video from your iDevice to the TV. As it is a Debian system, it is completely expansive and you can install any packages from Debian’s massive repository! Most people shudder when it comes to installing Linux (or any UNIX variation), but installers have got much better in recent years. As long as there are no errors during install, or you don't want to add esoteric hardware, Linux isn't that difficult these days. It's no OS X, but it's a far cry from UNIX systems of yesteryear. I initially downloaded a beta and installed it on an 8GB SD card from my digital camera. I use Win32DiskImager to copy the image to the SD card from my PC (took about 2 mins). Yesterday I installed Release Candidate 3 (RC3). An internet connection is mandatory for setup. So I plugged in a network cable, USB mouse and keyboard, connected the video to my 27-inch monitor with an HDMI to DVI cable and inserted the SD card. Finally, I powered it from my laptop using a micro USB cable. Immediately, I saw the usual Linux startup messages and then it started creating filesystems, loading the apps and downloading the latest version. Initial setup (hands off) took about 15 minutes and then I was greeted with the XBMC Confluence theme. After pointing it to my library of music and movies on my Windows Home Server, I left it for a few hours while it downloaded all the meta data, thumbnails and posters. The UI feels a bit sluggish, but for $35, I could live with it. This is more of a first impressions, than an exhaustrive test, but nevertheless worth sharing. First, I played some music. This worked perfectly. Next, the big test: video. Unfortunately, it repeatedly stopped and buffered in the first few minutes of most movies I tried (over wired 100Mbs). As the movie progressed, it seemed to settle down and played OK. I loaded a iPad 3 RIP of my Art of Flight Blu-ray (2.4GB) onto the local SD Card (SanDisk Extreme 3; Category 6) and still got the stuttering at the start. For the final test, I hooked it up to my Pioneer Kuro 50-inch plasma. Again, the initial stuttering continued, but once the movie got going it played almost flawlessly. I did experience the occasional hitch where a scan line seemed to be corrupt and progress down the screen. This is still beta software and early days, so I’m sure these kinks will be worked out. I also tried AirPlay from my iPhone 4S. Streaming a music video worked without a hitch, after a fairly lengthy sync time (in comparison to my AppleTV). The Raspberry Pi looks promising as a HTPC. Performance does need tweaking a bit. A new optimized version of Debian (named Raspian) is due soon. This is a hard-float optimized port of the Debian operating system for the Raspberry Pi, which should significantly speed up anything using floating point operations. People are already overclocking it to 1Ghz too. Unfortunately, it’s not for me. I’ll probably follow the raspbmc project and take OpenELEC for a spin. I hope UbuntuTV will get ported and I'll probably try that too, but I don’t have the patience for the tinkering. I've forgotten way too much about UNIX and I’m not a big XBMC fan. (That may change if Microsoft continue their seeming lack of interest in Windows Media Center.) For those who do like to tinker or are on a tight budget, it’ll probably be a good fit in the not too distant future.